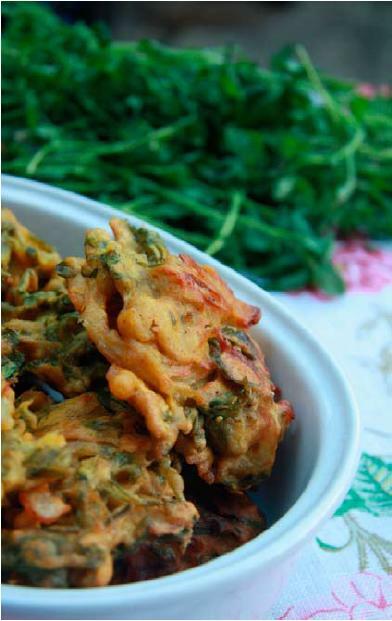 The slightly stringy nature of chickweed can make it something of a trial in the kitchen and pakoras are by far the best way to use it. This is a difficult recipe to get wrong - almost any quantities of the various ingredients will work - just make sure you use plenty of salt. The tablespoonful of medium-hot curry powder I suggest gives a mild flavour with a little warmth; if you like it hot then up the quantity or use a hotter powder. There may be purists who baulk at the idea of ready-made curry powder; if you are one, then feel free to use coriander, cumin, turmeric, chilli and so on - in whatever proportions you like. Mix the flour, curry powder, baking powder and salt together in a bowl, then slowly stir in enough water to form a paste the consistency of mustard. Mix in the chickweed and crow garlic and stir until they are well coated in the paste. Heat a thin layer of oil in a heavy-based frying pan. When hot, spoon in heaped dessertspoonfuls of the pakora mixture to form little cakes, spacing them well apart. Cover with a lid and cook over a medium heat for about 5 minutes until crisp and golden brown on one side. Turn the cakes over to brown the other side. Drain on kitchen paper and serve at once.